The Congress and the BJP have been exchanging barbs over the Rafale aircraft deal, with Rahul Gandhi accusing the Prime Minister of allegedly changing the "entire deal" to benefit a businessman, a charge debunked by the ruling party. 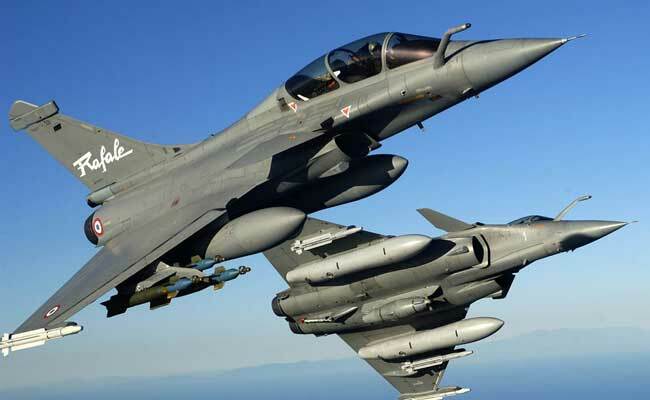 New Delhi: French Foreign Minister Jean-Yves Le Drian today said the purchase of 36 Rafale fighter jets would bolster India's security and it was a "win-win partnership" for both the countries. India had inked an inter-governmental agreement with France in September last year for procurement of 36 Rafale fighter jets at a cost of around Rs 58,000 crore, nearly one- and-half years after Prime Minister Narendra Modi announced the proposal during a visit to Paris. The delivery of the jets is scheduled to begin from September 2019. To a question on the row over the fighter jet deal, Mr Drian said, "I read the statement of the defence minister of India, who explains how the purchase of 36 Rafales has been a very good opportunity for India's security and a very good opportunity to work in the context of Make In India as well." At the launch of Bonjour India 2017-18, a four-month-long event to mark Indo-French partnership, he told reporters, "It (the Rafale deal) is really a win-win partnership." Defence Minister Nirmala Sitharaman had yesterday said the present government addressed the "vacuum" in the national security structure created by the indecisiveness of the UPA dispensation by "immediately" going for procurement of 36 Rafale fighter planes in a fly-away condition. About the event here, Mr Drian said the festival links history, contemporary reality and the future and shows the long term collaboration between the two countries highlighting what they can do together in terms of cultural creativity and technological innovations. "For Bonjour India, we would be organising over 300 events in 33 cities over a period of four months. Anyone visiting these events can understand our relationship, whether it is about cultural creativity or technological innovation," the French Foreign minister said. "Bonjour India is a big symbol of an Indo-French moment leading up to the visit of President Emmanuel Macron," Mr Drian said. The third edition of the festival would be held till February 2018 and provides a platform for enduring partnerships across the themes of 'Smart Citizen', 'High Mobility' and 'Go Green'. In the national capital, a major event would be held at the India Gate lawns, where a digital wall would provide an immersive experience to the audience. The show would present the history and connection of the two countries, while also underlining their future. Union Minister of State for Culture Mahesh Sharma said, "We have long term and time-tested relations with France starting from the field of cultural exchange and partnership in technology with ISRO. The theme for today also goes with the need of the time - Go Green. The Prime Minister values our relations with France."